Being an HR Expert, I have seen many candidates who come in and aren't even sure of the name of the company. 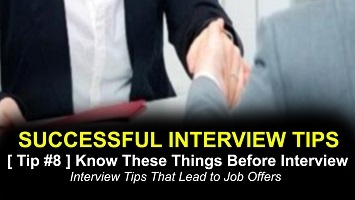 I want to suggest powerful tips you need to follow before facing an interview. "Research about the company and boss" this is a pretty simple step. Nothing's more embarrassing than simply not knowing the basic facts about a company and the position by the time you reach the interview. You won’t bring up all this information during the interview, but it will at least help you come up with reasons why the company is special and help you to know what topics to avoid during the interview. So, where can you find a detail information about the company or boss? Is there more you can do research besides a Google search and company website scroll? Fortunately, there are more resources on the web which are very helpful and effective for your next search. Last weekend, I went throughhuffingtonpost, where i found the answer to the above question. If you are unable to find the company information on "About us" "Contact us" section then do a Google search. Besides Google search, there is also Youtube Search engine where you can find the reviews from real customers and company products or services offered. Likewise, you can also check the LinkedIn Company Profile to know more about the company. Read closely to learn what might be different about this organization than others. LinkedIn is also a good tool for learning about what kind of news the company communicates. LinkedIn will often have information about the employees as well as ongoing job vacancy. Follow the company profile to see regular, weekly or monthly updates and news they post. If you come to know the name of the person you are interviewing with, then make a deep research into his past and current information. This helps you to play a familiar role during the interview. Similarly, Glassdoor.com is also one of the most useful websites where you can find the information about the company and salary range they offer to their employees. Review this along with any other “basics” you should be familiar with prior to the interview, like company size, location, and history. Glassdoor.com collects and makes reviews of different employers available. Glassdoor also offers you company related interview questions and answers that specific employers seem to use..
Lastly, check out the company’s Twitter and Facebook profiles. You may be able to glean a bit about corporate culture through a company’s blog and social media accounts. Identify some of the company's chief competitors and research them in much the same way you've research the company you're interviewing with. What differences do you notice? Tell the fact to your interviewer. This helps to prove the interviewer that you are the best candidate for the position.